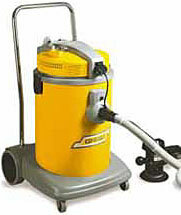 Medium capacity wet/dry vacuum cleaner equipped with a powerful and high efficiency new generation motor. Power outlet for electric tools (maximal power 2000 W). Manual or automatic functioning, vacuum cleaner starts when actuating the electric tool. Storage spaces for accessories. Exhaust air filter. Standard paper bag and cartridge filter. Medium capacity wet/dry vacuum cleaner equipped with a powerful and high efficiency new generation motor. Power outlet for electric tools (maximal power 2000 W). Manual or automatic functioning, vacuum cleaner starts when actuating the electric tool. Stainless steel container. Storage spaces for accessories. Exhaust air filter. Standard paper bag and cartridge filter. 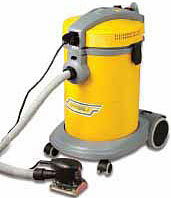 Wet/dry vacuum cleaner equipped with a powerful and high efficiency new generation motor. Very capacious tank, high power rating installed and exhaust air filter. Power outlet for electric tools with manual or automatic functioning, vacuum cleaner starts when actuating the electric tool. Wheeled chassis in anti-shock plastic material with accessories holder. Standard paper bag and cartridge filter. Nylon and HEPA cartridge filter available as optional accessories. Compatible with electric and pneumatic tools: power outlet for electric tools (maximal power 2000 W), power outlet for pneumatic tools (working pressure between 2 and 10 bar). Manual or automatic functioning, vacuum cleaner starts when actuating the electric tool. Storage space for accessories. Exhaust air filter. Standard paper bag and cartridge filter. Nylon and HEPA cartridge filter available as optional accessories. 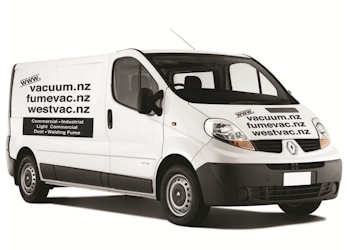 Large capacity wet/dry vacuum cleaner equipped with a powerful and high efficiency new generation motor. High power rating installed and exhaust air filter. Compatible with electric and pneumatic tools: power outlet for electric tools (maximal power 2000 W), power outlet for pneumatic tools (working pressure between 2 and 10 bar). Manual or automatic functioning, vacuum cleaner starts when actuating the electric tool. Storage space for accessories. Standard paper bag and cartridge filter. 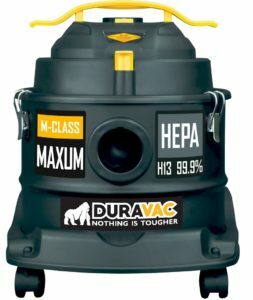 Nylon and HEPA cartridge filter available as optional accessories.